So while the Gertboard has LEDs and buttons, it’s really intended to be used to safely connect your Raspberry Pi to external devices, and to do this we need to look closer at what it provides. There are 12 buffered pins – these can be individually configured as inputs or outputs. As inputs they take a maximum of 3.3v and as outputs they can source (or sink) a maximum of 20mA each. 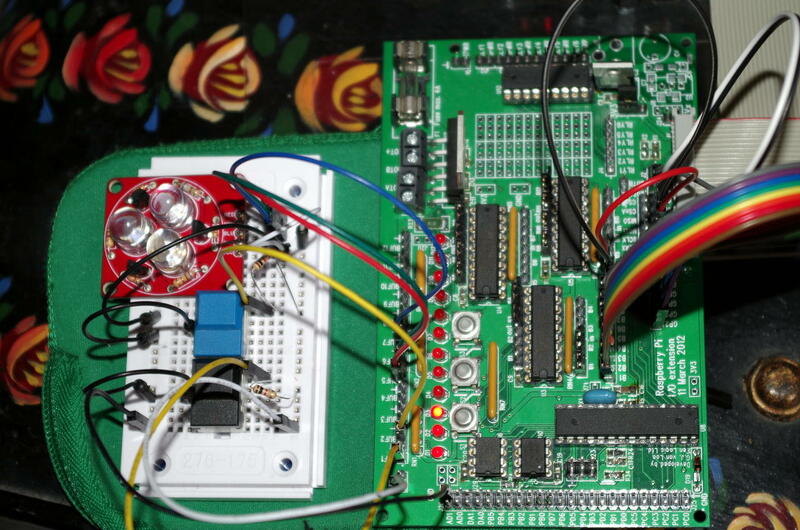 Additionally, there are 6 outputs that go to a ULN2803A darlington driver chip. These (open collector) outputs can sink a maximum total current of 500mA. They can be used to drive relays and small motors and small incandescent bulbs. As well as the 12 buffered pins and 6 higher power outputs, there is a motor driver which is capable of driving a DC brushed motor forwards, backwards or at a variable speed using PWM and there is also an analog to digital converter and a digital to analog converter. We will look at all these in turn. They can drive other 3.3v logic devices, small LEDs and sense switches, but remember that they are limited to an input voltage of 3.3v, and an output current of 20mA. 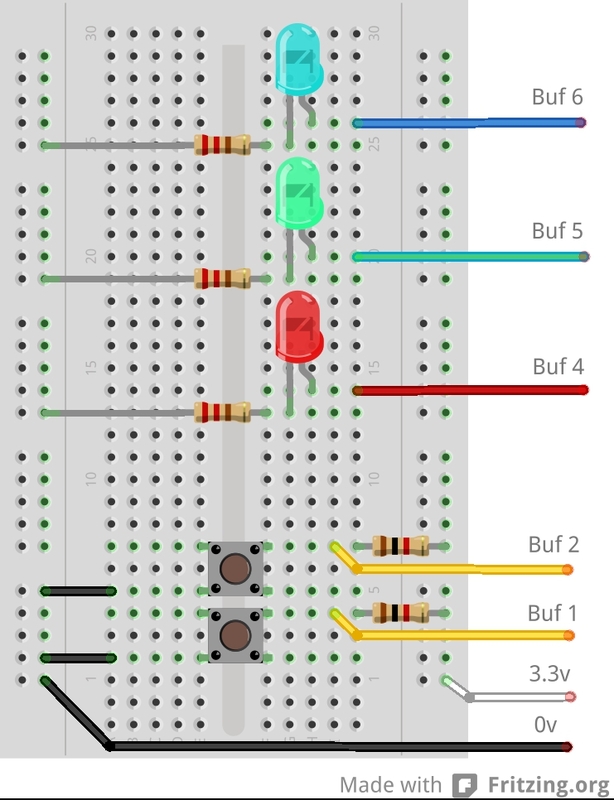 I’m running same buttons.c program as before, but this time using the buttons on the breadboard to turn the external LEDs on/off – the third button on the Gertboard controls the last LED. Note that I’m using large LEDs here which require about 80mA each, however they have their own buffer transistors which are being driven by the normal buffered outputs from the Gertboard. You can use regular LEDs, or even a tri-colour LED. The external buffered pins (Buf X) are just like the Pi’s own GPIO pins, but they go via a buffer which can help protect the Pi from mis-use. Inputs do not have any pull-up’s or pull-down’s so we need to provide this, if required. Remember to move the buffer Input/Output jumpers to the appropriate side of the 74×244 buffer chips when using the external Buf X pins on the Gertboard.